The leading provider of consumer goods in Africa, Unilever Kenya and Azuri Technologies, a leading provider of pay-as-you-go solar home systems, announced a partnership to bring solar home solutions to millions of more off-grid homes across Kenya. 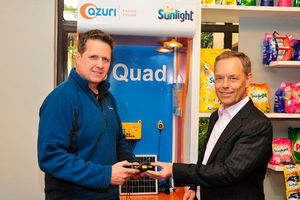 Unilever’s distribution network, which in Kenya is some 67,000 smallholder traders will be offering the Azuri’s Quad solar home system which will be cobranded with the Unilever Sunlight brand. Azuri’s existing partners in country of Raj Ushanga House and Mobicom will be complemented by the Unilever distribution network. Many households are located in regions where the provision of grid electricity is expensive and over 600 million people in Africa have minimal or no access to electricity. Through its innovative solar home solutions, delivering reliable, renewable and distributed power on an affordable pay-as-you-go basis, Azuri has been helping to address this challenge since early 2012. It is a well known fact that solar power has powerful economic and social benefits. Recent studies report owners of solar home systems on average are able to earn US$35 per month capitalising on the time recovery after dark. In addition, Azuri has helped create over 2000 new jobs through its Kenyan partner companies to sell, support and maintain solar home systems. The Quad solar home lighting system features Azuri’s award-winning HomeSmart™ technology with an artificial intelligence based system that monitors weather conditions and learns usage patterns to adjust output to ensure maximum power availability. The system also includes a 10W solar panel, four bright LED lights, USB port and connectors for mobile phone charging, rechargeable radio and rechargeable torch. Other products include the AzuriTV, the first PayGo solar TV system of its kind to be launched in Africa. This system features a 24-inch super slim LED TV, with over 100 satellite TV channels, four bright LED lights for indoor and outdoor use, mobile phone charging, rechargeable radio and a rechargeable torch. In 2018, the AzuriTV was named ‘Innovative Technology of the Year’ at the annual Africa Utility Week Industry Awards, honouring pioneering projects and people in the industry. Azuri was also named the 233rd fastest growing company in Europe by the Financial Times and named in Red Herring’s Top 100 Europe.